There was frost to be scraped off the car windows this morning in St. Louis and yet, through the miracle of American Airlines, I was home in San Diego by noon. I used the time in the air to add two new WebQuest Design Patterns: Ballot and Comparative Judgment. These will be useful, I think. If I can get the list up to about 40 patterns, this will cover most possibilities. I'm going to try to set aside some time for this over the next month. I've driven this road a half dozen times before, always in the dark: Interstate 70 heading west of St. Louis. All I see are long stretches with a few lights, punctuated every 15 minutes or so with exits leading the same ten fast food places. This time, though, I'm seeing it differently. I've got the PowerBook open on the passenger's seat, and ROUTE 66 is running. On the dashboard, I've got my nifty little Rayming TN-200 GPS thing. So now the darkness is embellished. Now I can see where those lights are coming from and that just behind the trees there are roads and lakes. It makes the two hour drive go more quickly, though I'm careful not to get distracted. The crescent moon and Venus are directly in front as I head west. Will Climate Change Change the Climate? It will be interesting to see if this report will also change the behavior of a guy who never admits to being wrong. That's a name that I'm guessing will be famous a few weeks from now, at least if Josh Marshall is correct as usual. Had my first successful iChat conversation tonight with Otto Benavides up in Fresno in preparation for my meeting with his class next Tuesday night. Very impressive. Good video and sound quality, completely transparent set up. Apple does it again! Actually, since we've been cleaning the house all day, I looked like a dog's lunch. Having good quality video is a mixed blessing. Maybe the next version will have a "Display me the way I wish I looked" checkbox. "Don't look back -- something might be gaining on you." Had a fun class with my EDTEC 296 kids. We were discussing Tapscott's Growing Up Digital and Prensky's Twitchspeed stuff. The question in the air was, are you really different from your parents' generation? And of course, they are. But the funny thing was that these 18 and 19 year olds are already looking over their shoulders at their 10 - 15 year old siblings. THEY'RE the ones that are really different, they tell me. This even younger generation would rather IM than meet face to face. They'd rather be online than play outside. One 15 year old even breaks up with his girl friends over IM. In lots of ways, these college freshmen are feeling outgeeked by kids only a few years younger. Are the generations getting even shorter? After a few hours sleep, we all got on the minibus one last time at 6am in Targoviste. From there to Bucharest, Paris, Chicago and home. Twenty-six hours in transit. 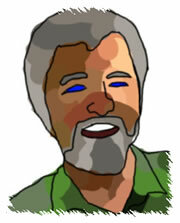 Pete MacKay's useful Teacher List has a pointer today to JungleWalk. This is a tremendous resource for elementary science and high school biology teachers. The site has approximately a bazillion links to still pictures, videos and audio files for every animal known to humankind. You can click here to hear the chirp of this Bell's Vireo, for example. Hmmm.... I just bought iLife with GarageBand. If I had all the time in the world, I'd put together a musical composition made of loops of these squawks and screeches and warbles. Call it Animal Techno. Or BioElectronica. There's an idea some kid could take on. After 24 years of deliberately flying under the radar here on campus, I've been outed by today's issue of SDSUniverse. Two nicely written articles cover my obsessions with WebQuests and blogging. Good thing I'm leaving town Wednesday. I hate elbowing my way through crowds of autograph hounds and paparazzi. Then again, with all eyes riveted on Janet Jackson's mishap, maybe no one will read it. Thanks to a pointer from Dori Smith at Backup Brain, I found World66's site that lets you map out the places you've been. Here's my US map, and you can easily create your own. My world map isn't nearly so filled in, though I'll be adding China, Taiwan, Singapore and New Zealand to the list before the year is out. (Hmmm... this may motivate me to only visit big countries from now on.) You can create your own visited country map, too. I had been thinking about whipping up something like this myself as part of an icebreaker for workshops and classes. I'd go beyond just making the maps and script it so that it picks out people who have visited the same unusual places (unusual to that particular group). Seems like a good way to get conversations started.